Springtime, when the flowers are blooming and the weather is warming, is the perfect time to get together with friends and celebrate the end of winter. Whenever you are entertaining, food will always be at the top of the priority list, and everyone loves sweets! So take a look at some of the best Spring desserts for a delicious and easy way to please everyone. 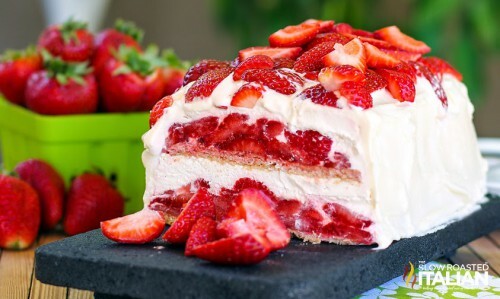 Easy to make and tasty, the No-Bake Strawberry Shortcake Icebox Cake is perfect for everyone! Sprinkle sugar on strawberries and stir until covered. Set aside a handful of strawberries for decorating the top of the cake. Whip the heavy cream with an electric mixer. And add the vanilla and 1/4 cup powdered sugar. Whip until stiff peaks form. Line a 9 x 5-inch pan with plastic wrap. Layer 1/3 of the whipped cream into the pan. Spoon ½ of the strawberries on top of the whipped cream, evenly. Top with a layer of graham crackers. Add another 1/3 of the whipped cream, smoothing it out evenly. Add the remaining strawberries evenly over the whipped cream. Top with a layer of graham crackers. Put a layer of plastic wrap over the top to cover. Freeze for 3-4 hours. Add the remaining 1 3/4 cups powdered sugar, pudding mix to the remaining whipped cream. Whip until it comes together. Refrigerate while cake freezes. Remove the cake from freezer, unwrap, and invert pan onto a plate. Remove the plastic wrap and frost with the whipped cream icing and sprinkle remaining strawberries on top. Freeze until ready to serve. 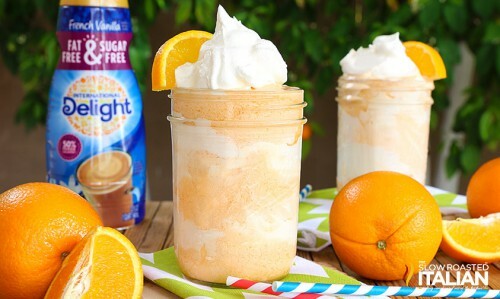 For a taste of Spring, try this Orange Creamsicle Shake! Combine creamer and orange juice cubes in a blender, until shake consistency. Add additional creamer or milk if you need to thin it out more. Alternate layers of shake mix and whipped cream in large glass until full. Top with a dollop of whipped cream and a fresh orange slice. 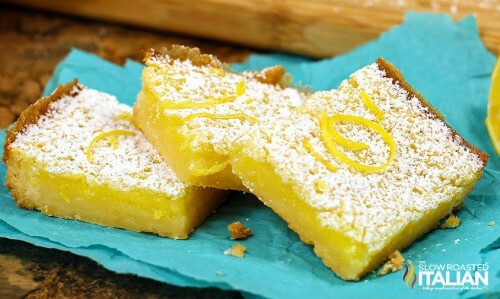 These lemon bars look beautiful… and taste even better! Preheat the oven to 350°F. Prepare a 9×9-inch pan with baking spray. Combine 1 cup flour, ½ cup powdered sugar, butter, and salt with a fork until a crumbly dough forms. Press the dough into the prepared pan so it covers the bottom and goes about 1/2 inch up the sides. Bake about 10 minutes or until light golden brown. Whisk together the 2 tablespoons flour, eggs, sugar, lemon juice and lemon zest. Remove crust from oven, pour the lemon mixture over the crust. Bake until center is set, 20-25 minutes. Let cool for 30 minutes in pan. Remove from pan and refrigerate until completely cooled. Sprinkle the remaining powdered sugar over the cooled lemon bars before serving. Get ready for the perfect time spent with friends with a few of the best Spring desserts for entertaining. And for the best place to entertain and live, be sure to contact us or stop by any of our locations to find top-of-the-line new homes for sale today!